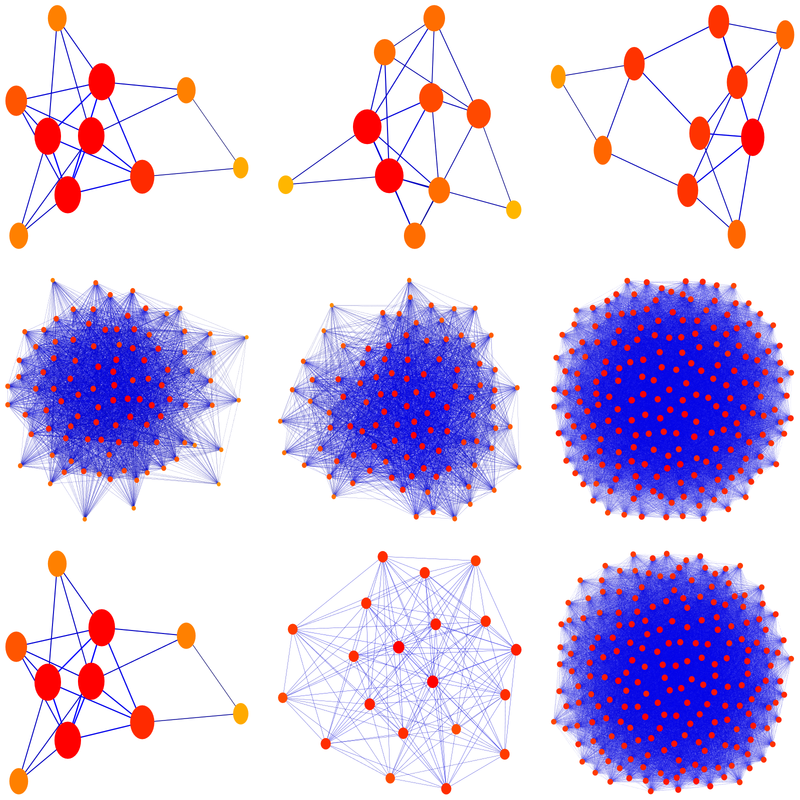 We explore here a ring of networks which naturally extends the ring of integers. It might allow to use of commutative algebra to be used in graph theory. Since algebraic geometry notions have naturally been extended to commutative rings, one gets now a huge playground to investigate. What is the number theory of primes, how hard is prime factorization, what is the spectrum in that ring? What are the topological properties of the spectrum etc. But at first it is much more primitive. We can explore a “number system” similarly as the first mathematicians explored the number system of integers or in parallel, what kids explore when learning numbers. What are the negative numbers, what are fractions, what are the prime numbers? Is there a natural field containing this ring? Can this field be completed so that one can do analysis on it (the real and complex numbers)? Can one do cryptology with this ring? But like a kid exploring numbers, we can explore here a number system which has not been considered yet. It is a proud result of fraction lab. In an older post, the problem of unique prime factorization in the monoid (finite simple graphs, join *) has been raised. After having tried in vain for two weeks to find an addition which is both natural and renders the networks into a ring and * the multiplication (this is suggested by the fact that the join is very much related to the Cartesian product and because it can be implemented nicely algebraically as a multiplication in a Stanley-Reisner ring), it appears better to let the join be the addition in a ring. The Grothendieck construction (which parallels the Egyptian invention of fractions) renders the monoid into an Abelian group. But what is the multiplication? I think to have found one. Since Kn * Km = K n+m why not look at a multiplication which has the property that Kn x Km = K n m and which satisfies the distributive property Gx(A*B) = GxA * GxB. There is such an operation. As the number of vertices now should multiply. After checking through a few candidates of multiplications and and checking the distributivity property on random graphs, a multiplication in which the vertex set is the Cartesian product appeared. So, I will write here the join operation with a plus sign +. 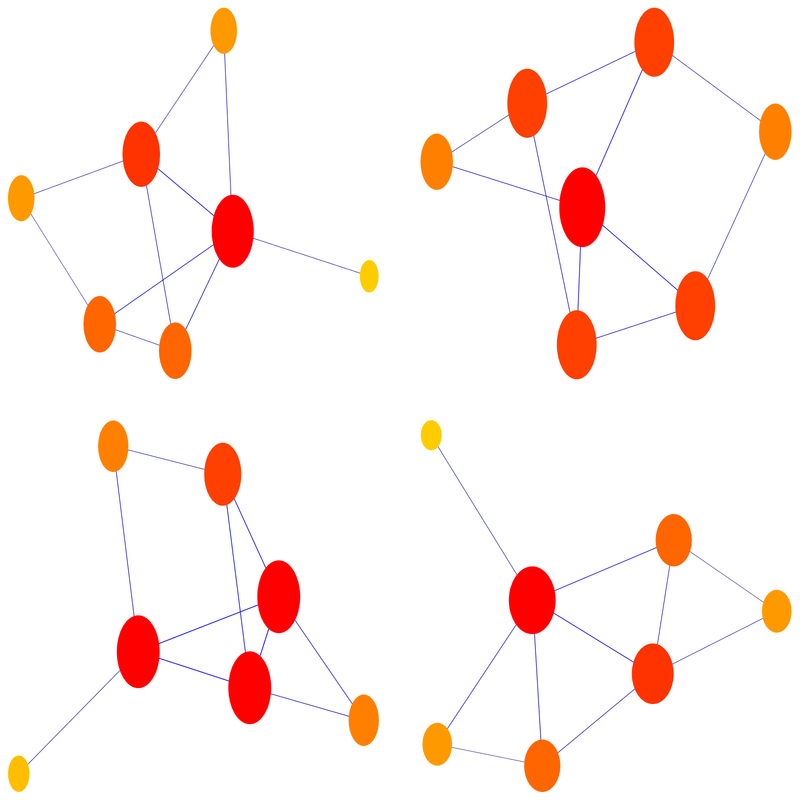 Remember, the join of two graphs takes the disjoint union of the vertex sets, leave the old connections and then connect any pair belonging to different graphs. We will look at the problem to get a natural representation of the negative graphs later. The 0 element is the empty graph. The monoid (graphs, +, 0) has still an interesting prime factorization problem. Graphs play the role of integers and an additive prime is a graph G which can not be written as H+K, with two non-zero graphs. In integer arithmetic, we have only one additive prime, it is 1. All other integers can be factored like 5=1+1+1+1+1. The additive prime factorization problem is trivial in numbers. We have seen it to be interesting for networks. Just take as vertex set the Cartesian product of the vertex sets of the two graphs, the connect any two pairs, if one or both of the projections onto the first or second graph is an edge. I don’t know whether this product corresponds to any topological construction in the continuum (the tensor product comes close in the case of linear spaces). It would be a product of topological spaces in which the quantity c(G) = (dimension(G)+1) is multiplicative. This product has nice properties. It has the one-point-graph K1 as one element 1, the multiplication is commutative and distributive. It extends the usual arithmetic of integers. How do we think about negative numbers like -3? 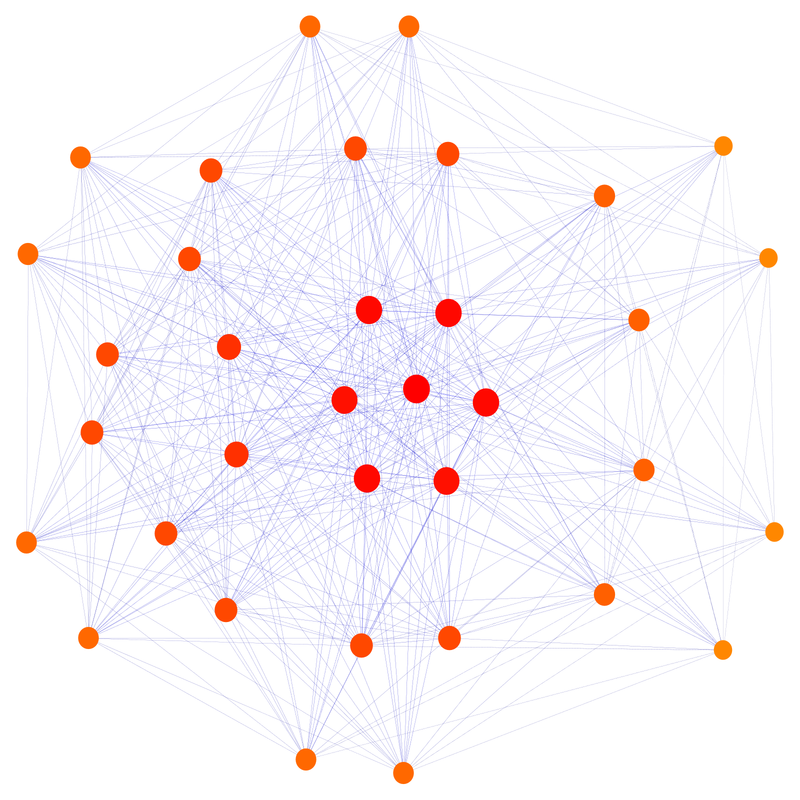 It is the complete graph with three vertices coming with a negative sign. Let X be the smallest set of objects generated by complete graphs which is closed under both addition and multiplication. This object X now plays the role of the ring of integers. The algebraic structure (X, +,0,x,1) is a commutative ring. It contains the bi-monoid (graphs,+,0,x,1) of graphs. It contains the sub ring of all complete graphs (together with negative complete graphs) which is isomorphic to the usual ring of integers (Z,+,0,x,1). On that subring, the ring isomorphism is given by the clique number c(G)=dim(G)+1 as c(Kn) = n and c(Kn + Km) = n+m and c(Kn x Km) = n m.
or connections ((a,b),(c,d)) within GxK or then connections between any pairs ((a,b),(c,d)) for which (a,b) and (c,d) belong to different graphs GxH or GxK. There are infinitely many multiplicative primes. Every graph with a prime number of vertices is prime. There is a prime factorization. The question about 3unique prime factorization is also still open. So, we have now two unique prime factorization problems. One for addition and one for multiplication. 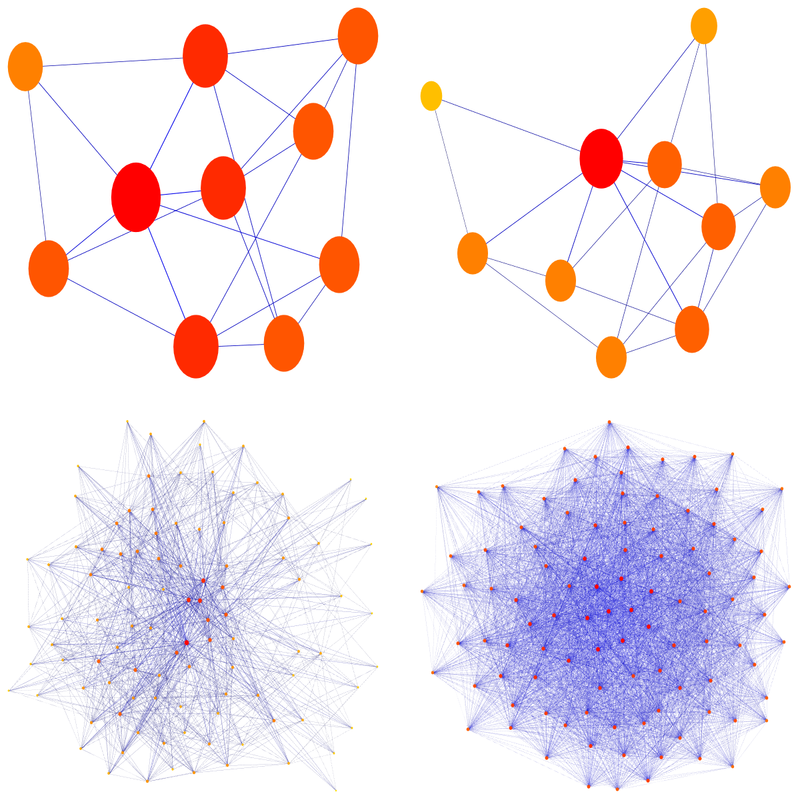 The network factorization problem in the ring of networks is at least as hard as the integer factorization problem. It could be much harder although as we need also to figure out the connection parts in the factors. The brutal brute force attack is to factor the vertex cardinality then write the vertex set as a Cartesian product of two sets with that cardinality, then figure out the connections. Here is a product graph P*Q with p*q = 5*7 vertices. 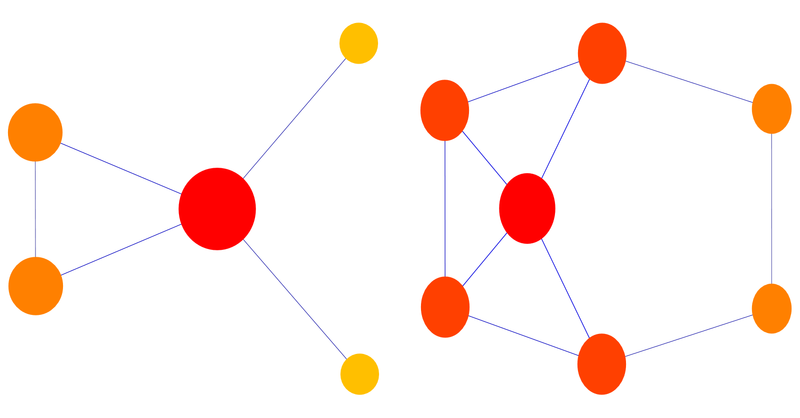 The network P has 5 vertices, network Q has 7 vertices. The product PxQ has 35 vertices. Can we find the factors easily? One could try whether values of some functionals allow to get insight into the factorization. But so far, none has been found. The Euler characteristic of the factors are 1,0. The Euler characteristic of the product is 12 in this case. The vertex degrees are (2, 4, 1, 1, 2) and (4, 3, 2,2,3,3,3). The product has the vertex degrees (26, 23, 20, 20, 23, 23, 23, 26, 23, 20, 20, 23, 23, 23, 32, 31, 30, 30, 31, 31, 31, 23, 19, 15, 15, 19, 19, 19, 23, 19, 15, 15, 19, 19, 19). But there would be a lot more to look at, like the topology of unit spheres, curvatures etc. It looks as if also an other enigma, the problem to find a modular arithmetic in networks can be reasonable, as we have a ring. We can take a multiplicative prime like P= K3 and look at all networks modulo this prime. In other words, two networks G,H are the same modulo P, if G = H + KxP for some other network K. In order to have this to work, we need the Euclidean algorithm to work which asks for the ring to be an Euclidean domain. This is not obvious at all or could be false. The Euclidean function one can shoot for the clique number or number of vertices of a graph. The question is now that if G is a ring element and P is given, can we find K such that the clique number of G-K*P is smaller than the clique number of P. Can this K be made unique by minimizing the clique number or maybe even by minimizing the number of vertices. But first we need to play more with the arithmetic. [By the way, the tensor product of graphs mentioned earlier when comparing different products is different from the just described product. Thats why it is probably not a good idea to call it tensor product. I call it just the “product in the ring of networks”. Here is a picture which shows the comparison between the standard tensor product of graphs and the new product x we have introduced here: we take two random graphs. To the left below we see the tensor product, to the right the ring product. You can readily check with examples that the tensor product does not play well together with the join. Distributivity fails! We have distributivity however for the new product. If A is the automorphism group of the graph G and B is the automorphism group of the graph H, then the automorphism group of G x H contains the product group A x B. An obvious question is whether the automorphism group can be larger. It definitely can, like if G=H, then there is also an involution switching the two networks. Here are some examples of arithmetic. We write for the graph with n vertices and no edge, the cyclic graph with $n$ vertices, the wheel graph (n spikes) with n+1 vertices and the star graph with vertices (n rays). First some things we have already mentioned. If $G$ is a n-dimensional sphere, then the product is a ((n+1) m-1)-dimensional sphere. Linear combinations of spheres with integer a,b are spheres. One of the challenges will be to be able to reduce such an expression. A silly example is (C4 | O)/(K5|K3) which simplifies to P2/K2. A completely open question for me is to complete the field, that is to find a metric or valuation which allows to take such limits then take equivalence classes of Cauchy sequences. Like in the case of extending the rational number to the reals, it is important to have that since we want to define things like exp(G) or zeta(s) defined by the primes in the ring. can be done reasonably by hand. Maybe that is just what can make the ring attractive for cryptology. However, for being useful as such, one would need a modular arithmetic in the ring of networks so that one can deal with a finite group, similarly as with arithmetic on elliptic curves over some prime. or G modulo the prime P2, which is the zero dimensional sphere and even smaller than K2? While the graph K2 x G is equal to G + G, the join of G with itself, the graph P2 x G consists of just two copies of G without any connections between the two parts. But what does it mean to take a graph modulo P2? They are equivalence classes where two A,B are equivalent, if A=B+G x P2 for some G. It is questionable whether there are finitely many equivalence classes. An other thing to explore is whether to fix a host graph G and both when adding or multiplying networks reuse old vertices. This would seriously change the arithmetic. The elements of the finite group would be the sub graphs of G but already addition is questionable. One could try the symmetric difference of vertices but what about the connections? Just deleting the connections to the intersections? And then the multiplication. On the ring of sets, the intersection is the multiplication. But this has little to do with the multiplication defined above. Even if we wanted to extend the Boolean ring on the vertex set to networks, this does not work. 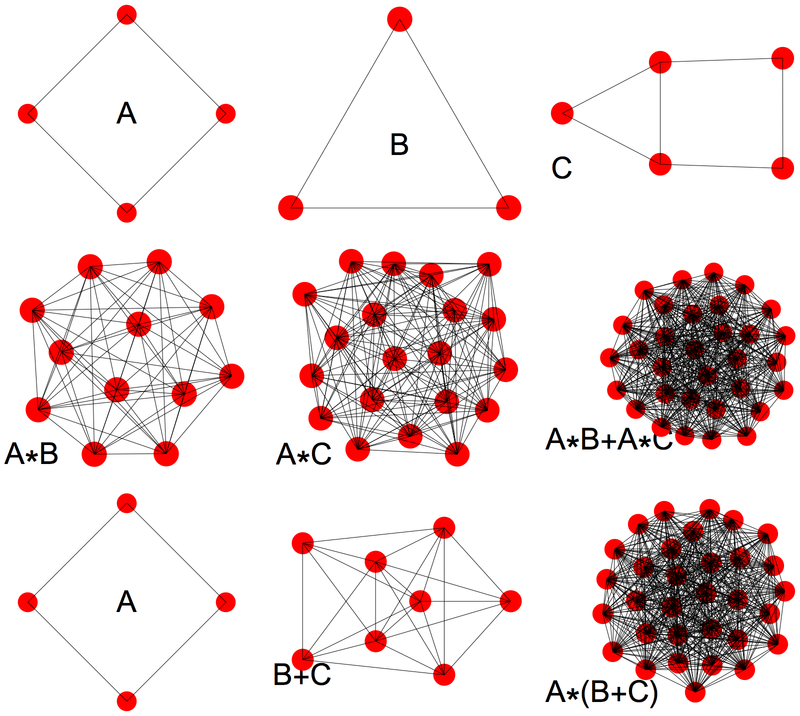 Graphs form only a Boolean lattice, not a Boolean ring. It appears that a modular arithmetic based on a host graph is not obvious. Especially if we want to have it relate to the entire ring of networks. In our case, the cardinalities of the graphs follow the usual arithmetic.